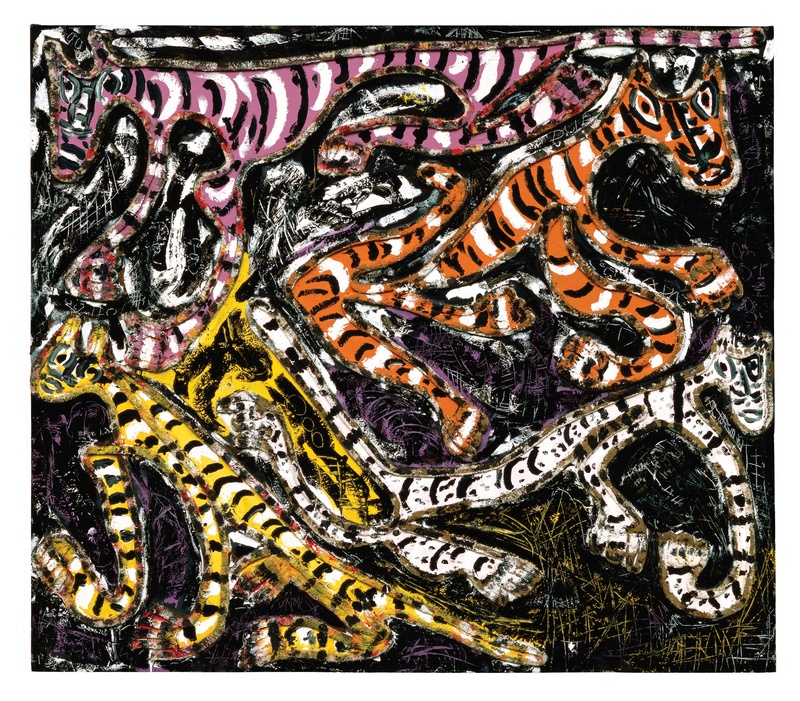 In his earliest paintings and sculpture, Dial expressed the theme of continuous struggle through the iconic image of the tiger. In his earliest paintings and sculpture, Dial expressed the theme of continuous struggle through the iconic image of the tiger. The main protagonist in many paintings created from the late 1980s to the early 1990s, this wily trickster became the perfect embodiment of the quest for social progress. An avatar of the oppressed, Dial’s tiger is always trying to climb his way to freedom, slink past the gates of dominant culture, claw his way out of trouble, and land on his feet despite the dangers and indignities imposed on him. Dial formed many of his tigers figures from swatches of rugs and carpeting that resemble animal fur. More significantly, his use of these materials was intended to symbolize the tiger’s downtrodden position within a racist society hierarchy, the dilemma of being repeatedly and ruthlessly “stepped on.” In a number of works, including All the Cats in Town, Dial outlined his tiger characters in carpet rope to evoke the redoubled meaning of being inexorably bound to one’s lowly inglorious fate.